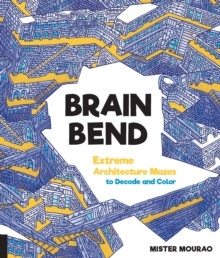 Brain Bend is a unique book featuring 25 wild, vibrant, architecturally themed mazes, along with black-and-white versions of the same artwork for coloring in. Artist and illustrator Mister Mourao's stunning, mind-bending designs, which range in style from joyfully freeform to impressively structured, offer a stimulating visual challenge to maze and coloring enthusiasts. Includes maze solutions at the back of the book. Perforated pages make it easy to remove the designs, and high-quality, heavy, uncoated paper make them a pleasure to solve and color.